With so many banks and types of accounts to choose from, it’s no wonder many Americans don’t know how to select the best bank option for them. GOBankingRates surveyed over 1,000 people to find out more about American banking habits and preferences and found that many people don’t understand the differences between account types — and are wasting too much money on unnecessary banking fees. Instead, that money could be earning interest in a high-yield savings account with the best banks of 2019. Many banks charge different types of bank fees for things such as withdrawals from out-of-network ATMs, overdrafts and not maintaining a minimum balance. GOBankingRates’ survey found that the average American pays $7 in banking fees every month — and although that number seems small, it can really add up. If you put that $7 each month into a savings account with a 0.09% APY, which is the national average, that would add up to an additional $91 in savings each year. 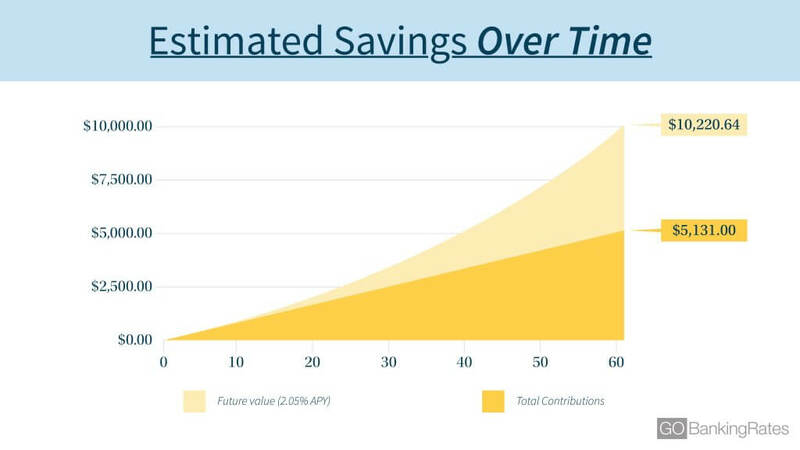 Over a lifetime, that would amount to $5,274 if that money had been deposited into an average savings account, or a staggering $10,221 with a high-yield savings account, such as the one offered by Bank5 Connect — one of the nominees for GOBankingRates’ Best Savings Account of 2019 — which has a 2.05% APY. Americans were asked what features or perks would entice them to open a new bank account, and the top response was good rates, with 38 percent selecting this option. However, many Americans don’t actually know how to choose an account with high rates. When asked which of the different types of bank accounts has the highest savings rate — from a choice of CDs, checking accounts, high-yield savings accounts, jumbo CDs, money market accounts or regular savings accounts — a third of Americans said they didn’t know. The next most popular choice was checking accounts, with 27 percent choosing this answer. Although some checking accounts allow you to earn interest, checking accounts tend to have lower APYs compared to any of the other account options listed. So which accounts typically offer the best savings rates? CD accounts (both regular and jumbo) and high-yield savings accounts. Survey Question: What Type of Bank Account Usually Has the Highest APY/Savings Rate? Additionally, many Americans don’t know the difference between APR and APY. Thirty-six percent of Americans surveyed said they would choose a bank account with a 1.25% APR, and only 24 percent said they would choose an account with a 1.25% APY, when given the choice between these accounts and ones with 0.10% APR, 0.10% APY, 1.00% APY, 1.01% APR or 1.01% APY. APR stands for “annual percentage rate,” and it’s the total amount of interest that you’ll pay annually to secure the loan, including the interest rate plus other charges. APY stands for “annual percentage yield,” and it’s the total amount of interest that you’ll earn from a deposit account, including the interest rate and compounding interest, over the course of a calendar year. When choosing a checking, savings or CD account with the best rates, you should look for an account with the highest APY. There was an inverse relationship between age and percentage of Americans who answered this question correctly, with 86 percent of post-millennials/Generation Z, 79 percent of millennials, 76 percent of younger Gen Xers, 68 percent of older Gen Xers, 66 percent of younger baby boomers and 63 percent of older baby boomers choosing the right options. The survey also asked respondents what types of bank accounts they currently have open, from a choice of savings accounts, checking accounts, money market accounts, CDs, bank IRAs and other accounts. Most Americans across all ages have checking accounts, but younger generations are more likely to have a savings account. Over half of all respondents ages 18 to 44 have a savings account open, but that’s true for less than half of respondents ages 45 and older. Female respondents were more likely than male respondents to say they didn’t know what type of bank account usually has the highest savings rate, with 39 percent of females unable to identify the account with the highest rate versus 26 percent of men. Male respondents also appear to have a better understanding of APR vs. APY, with 28 percent of men opting for an account with a 1.25% APY — the highest savings rate of the account options offered — and only 20 percent of women choosing the correct answer. Most people across age groups have the same savings goal for 2019 — except for Generation Z. Respondents ages 25 and older are mostly aiming to save more money for emergencies, whereas members of Gen Z want to save more money in their regular savings accounts. More female respondents than male respondents expressed a desire to save more money for emergencies in 2019, at 53 percent and 42 percent, respectively. Older generations tend to prefer banking in person at a physical branch or ATM — 78 percent of older baby boomers have a deposit account with a traditional brick-and-mortar bank. However, to secure the best rates, Americans of all ages might be better off putting their money in online banks, which tend to offer customers higher interest rates thanks to lower overhead costs. Despite their reticence to move to a fully online bank, older Gen Xers and older baby boomers have already embraced mobile banking: 81 percent of respondents ages 45 to 54 as well as 80 percent of respondents ages 65 and older said they wouldn’t open a new bank account with a bank that doesn’t have a mobile app. So, taking the leap to an online bank might not be too far off for these generations. Whether your goal is to save more for emergencies or to cushion your regular savings account, avoiding bank fees should be part of your savings strategy. Some easy ways to avoid paying costly banking fees include opening a no-fee account, sticking to your bank or credit union’s ATMs for withdrawals, maintaining your minimum balance, signing up for e-statements to avoid a paper statement fee and setting up a direct deposit. If you want to make the most of your money, check out the finalists in GOBankingRates’ Best Banks of 2019. Methodology: This survey was commissioned by ConsumerTrack and conducted by Survata, an independent research firm in San Francisco. Survata interviewed 1,001 online respondents between Dec. 7-10, 2018. Respondents were reached across the Survata publisher network, where participants take a survey to unlock premium content, such as articles and e-books. Learn why these are the best banks that don't charge fees. How does your banking knowledge compare to the rest of America?